Crude Oil Futures (CL #F) Shorts And The Sports Illustrated Cover Jinx – What Do We Do Now Coach? I do not own the rights to the above photo, other than to prove a contention posed later in this post. 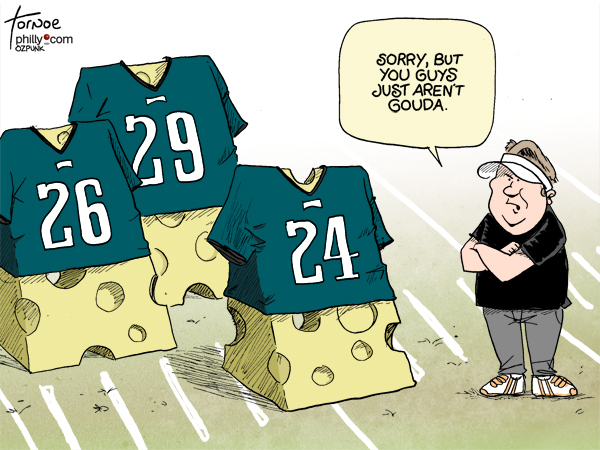 All impugning ( editorial or sardonic) of Michael Vick, Andy Reid, or the Philadephia Eagles (and I know of at least two of their fans who read this blog regularly) are the responsibility of the cartoonist, Rob Tornoe. I am a strong believer in parity, particularly when discussing ANYTHING about NFL football teams. Now, back to the main attraction. I was absolutely waiting with bated breath for this article, whose title is “Oil Warning: The Crash Could Be The Worst In More Than 45 Years”. I think this almost qualifies for the Sports Illustrated Cover Jinx award. If you know what that is, then one would think that we could indeed be at a bottom. We might, and again, we might not. Why? Because another notable analyst has looked at forward demand picture and still sees oil at or above $100, certainly in the next 5 years, if not before. Who is right? I am not going to go there just yet. If you recall, I was going to track the set up of crude oil futures back in the spring, and then all the nuttiest began to erupt in the Middle East, and short-term panic-mongers pressed oil prices higher. I left that article hanging (and a lot of readers wondering if I had just given up). I had not. I was looking for a little more evidence. Now, I think I have some. It is not, as one might imagine, from some short-term swing chart of price ticks on futures data, but on a WEEKLY chart of continuous crude oil futures prices. Sometimes, you need long-term data to make short to medium range forecasts. I will attempt to demonstrate that now. I just downloaded the latest upgrade of Ensign 10, and for some reason, the Pesavento Pattern application seems permanently set at ‘Def-con 98′. It is everything that Vince Rowe used to cross his eyes at when I demonstrated this stuff on Webex simulcasts. Please do not be alarmed. This chart is marked for what is important among all those insanely jumbled convergence points. It does make great eyesight training though. 1) That weekly low of January 16. 2015 has 13 different Fibonacci points of confluence that converge at that point. You really only need 4 to make that a very significant low. 2) On a weekly basis, that low has yet to be exceeded, so it is safe for now. 3) It should worry longs that there is a succession of bearish candles that continues to close at or near the lows of the week. If that continues, item 1 above will not hold, and we will see some new lows in crude oil. 4) Here is where the stuff gets weird (and why I cut the chart off before showing the full price symmetry low). At the cycle high of 107.68 and a lowest low of 44.20, the new displacement to a price symmetry low would be the difference of $107.68 and $44.20 or $63.46. At the previous swing high of $64.45, the symmetrical momentum low of that A-B=C-D swing pattern would be…wait for it…$0.97 cents a barrel. Yep, that is, though rather unbelievable, exactly 97 cents a barrel. That is situation is absolutely nuts, but the symmetry is there. We really only saw crude oil prices (and particularly futures prices) flirt with the teens in the late 1990s. It is certainly possible, with Iran going online without sanctions to sell their oil, OPEC attempting to destroy U.S. domestic oil prices, and new world oil producers running their drilling rigs again, that we could see prices fall dramatically. 1) Surging demand for oil in every place but China. Since last year, demand has increased by 1.6 million barrels a day over last years average. That ultimately means that the stocks of many integrated oil companies can (and in many cases ARE) trading at three decade lows and are relatively cheap, assuming the economic cost of exploration can remain reasonable and that the sales price and cover the cost of recovery, refining, and marketing of end products. 2) The overwhelming number of stupid, greedy, power-hungry leaders around the world. OPEC actually increaed production of crude oil by 1.5 million barrels a day from February to May 2015, much more than eclipsing world demand increase. Libya may come on line with oil under some kind of new leadership. Iran, with sanctions lifted, will likely also pour oil onto the world markets. Would you trust oil market economics to a person like Ayatollah Khamensi who posted this mature tweet? If you remember the late 1990s the way I do, you remember the Saudi princes having to sell real estate and bail out of their lavish lifestyles because the oil revenues would no longer support them. If the world economy slumps into recession, as it could, the worse case scenario is a possibility. I very seriously doubt you will be able to buy a barrel of crude oil for what you once could pay for a McDonald’s cheeseburger, but there is likely no historical precedent other that the mid-1980s and late 1990s that could ever compare to it. If, by agreement, oil production were managed by agreement, there might be a chance for it to stabilize, but that would take real leadership and not the elitist form of world fascism we seem so carelessly to be gliding into at the moment. “My way or the highway” is the watch phrase of the day. The factors that could cause prices to rise is a potential interruption of supply should ISIS or Iran decide to create some kind of a blockade or interdiction of oil movement of some kind. If you watch the video associated with the case for $100 a barrel oil, the case is fairly solidly made for the lack of stored supplies at the moment, even in the US. With little inventory, prices could indeed spike, and capital expenditure could once again be justified to bring drilling online, and that process is NOT instantaneous. There are way too many mitigating factors to make a collapse in oil prices a certainty, but in order to see this football game, you WILL need a program, because the players change constantly and the rules are fluid (much like NFL refereeing ). Before we descend upon gloom and doom associated with an oil bust, just remember the chart. The only significant thing to be watching now is that price of $44.20. If it holds, and we get some traction, then we could be in for at least some kind of rebound. That rebound of course will take time. I think I tweeted about 11 months ago that we could see the breakdown above $78 a barrel in Stocktwits, but I will have to dig that up. If you are going to short, then, from a practical perspective, it is likely only to do well if it breaks that $44.20 price level. Whatever happens, it is going to be interesting, and I would assume not without a bit of volatility as oil bulls and bears put on the riot gear and go after each other. That is the nature of market liquidity. Everyone gets a good clubbing before the winner is decided. To have a better discussion of what the real price lows are, I will wait for that to happen, and post as I see things happen. We live in a crazy world at the moment. Charts help you to see benchmarks and targets, but you have to use your brain and manage your risk as well. Once again, thank you for supporting this blog! Great article, but I think the chart is missing. It is fixed now. Strange things happen when I upload things lol.